My permission was to enter from the Ardales side (where the reservoirs are) at 12pm, so I headed for there and parked up by the Kiosko Bar/restaurant and still had time for breakfast. Instructions are to be at the checkpoint 30 minutes before your allotted time and It took me 20 minutes to get there at 11:15 via the signposted footpath that goes through the tunnel to the right of Kiosko bar. There were just a few people waiting at the checkpoint and it was interesting to see that people with permits for 11:30am, 12pm and 1pm all entered at the same time of 11:40am. (The guy checking permit said this was happening a lot.) We were issued with hair nets and helmets and off we went. 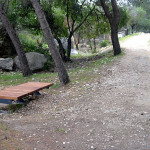 The Caminito can really be divided into 3 parts, two boardwalks and a woodland trail. 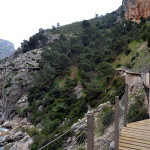 The first boardwalk gently eases you into the Gaitanejo gorge and is not so high, then there is the woodland part that gets you to the second boardwalk that is higher and passes by the transparent platform so you can stand and look down at the river below. The highlights for vertigo is the suspension bridge built by the side of the old “bridge” and the transparent floor…The woodland part has plenty of places to sit and enjoy the stunning scenery or have a picnic. 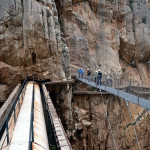 I walked as far as the suspension bridge then turned around and came back the same way. 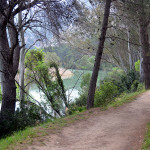 Remember if you want to return by walking DON’T pass the second checkpoint or you would need another permit to get back on the Camino. All in all a great experience but as a person who has walked and climbed this path before the restoration it has definitely lost some of it’s appeal (for me anyway). That said, if you have never been here before then I can highly recommend the experience. Full instructions on how to get a permit here… But be quick as places are filling very fast and soon there won’t be any available until October 2015. 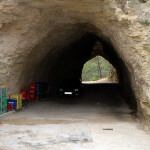 I was up there yesterday to find it easy friday where I have permits, and I wonder why the tunel close to Kiosko Bar say 2,7 km and the small tunel aprox 200 meter before says 1,5 km. Will we come to the same checkpoint, if we take the 1,5 km.? Where did you manage to get the permit? We would like to go within this week, but there was no opportunity to book a permit in advance at the homepage for April-May. Is it possible to get it in the Kiosk? 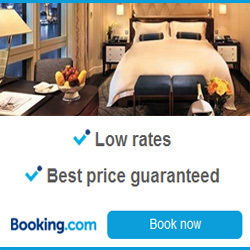 Booked in for August, can’t wait. Am I right that the walk from the tunnel from the Kiosko bar, where the special bus stops, to the checkpoint takes no more than 30 mins? 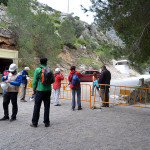 Also do you know exactly where in El Chorro I can catch the bus? Many thanks for advice and congrats on your helpful website. 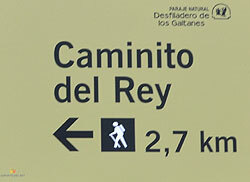 We are coming to the area in August but have missed the boat with the Caminito – the whole of August is now in the red! Can you recommend any other good walks in the region? (We are staying half way between Malaga and Granada). 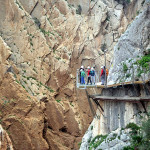 This hotel close to the Caminito del Rey can help with permits if you book a night there and it is a fantastic place to stay. Can anyone please tell me how long the shuttle ride is from the North Access to the South Access that we can take? Also, is there a bus from the North Access that goes to Malaga? 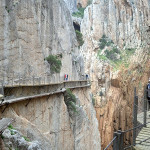 I saw one that goes from Ardales to Malaga, but I wasn’t sure if it was talking about leaving from the city part of Ardales, or the Caminito del Rey part? Any ideas what company will be operating the issuing of tickets for October 2015 onwards … Tickets are completely allocated upto and including September ! Many thanks for any info ! Thanks again for great advice. Much appreciated. Hello! Thank you for all of the information you’ve provided! 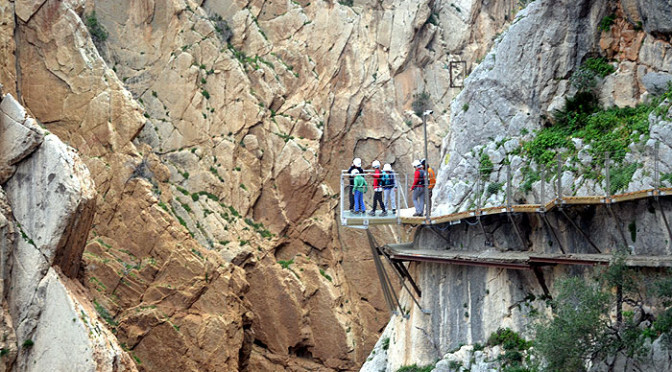 I see that there is the hotel La Posada del Conde that can arrange for entrances to El Caminito del Rey– are there any other hotels in the area with the same deal or only this one? I want to take the walk in July 2016. I will come by car (from Nerja) to el chorro. Can I start the walk there ? Thanks for the information, Clive !! !